2012/04/23 - Alexander Shorokhoff presents "Miss Avantgarde"
„The watch Miss Avantgarde will satisfy even the ambitious public in Basle,” Alexander Shorokhov, German watch producer and designer with Russian roots, is convinced of. The flagship of the modern AVANTGARDE collection forming a contrast to the classical collection HERITAGE is asking for courageous people embodying their own style. “Miss Avantgarde” is a homage to Gaudi and Hundertwasser, Kandinsky und Malevich. The design is innovative. Incomparable. Independent. It provokes. For a purpose – it should not be a mainstream watch. 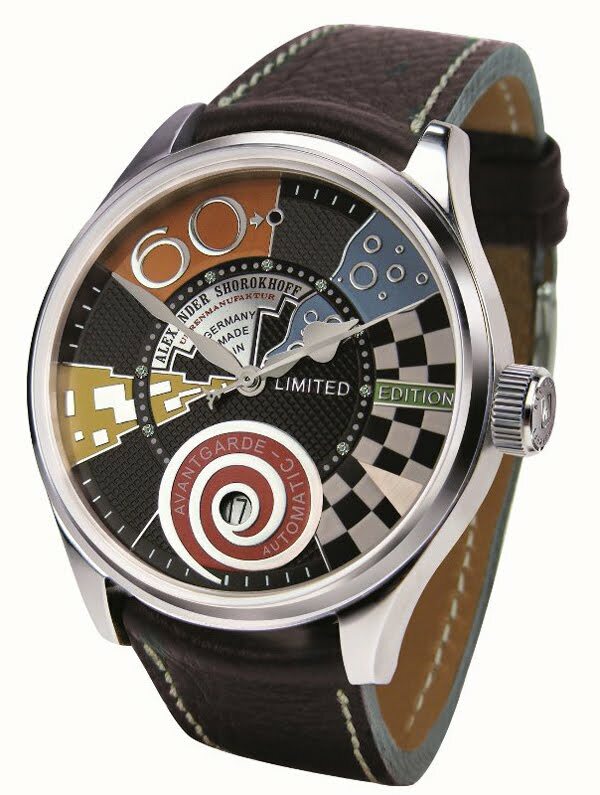 Regardless to all abundance of colours and forms Alexander Shorokhov has outlined the dial clearly. The typical dominant figure “60” as unalterable element of style of the AVANTGARDE line appears here, too. However, it is playfully shifted to the left. The size of 39 mm diameter and 9 mm heights fits a ladies’ wrist. It is a watch for courageous, selfconfidents, creative and independent women-individualists. In order to rest a rare piece the watch “Miss Avantgarde” is limited to 500 pcs.